A is for apple. Considering how easy the apple is — to pick and to eat — it makes sense that so many kids start the alphabet with it. Around the AMC region, apple-growers are readying for this year’s harvest. Local apples are already showing up in grocery stores in the north country. The apple tree, a member of the rose family, apparently originated thousands of years ago in mountains between modern-day China and Kazakhstan, where it likely became the first tree cultivated by early farmers. (The capital of Kazakhstan comes from the Kazakh word for “apple.”) Alexander the Great is credited with sending dwarf apple trees back to Greece from this region. Apples arrived in England around the time of the Norman Conquest. Early American colonists brought apple root stock with them when they traveled to the New World. An apple orchard established near Boston in 1625 is said to be the first in North America. Because apples keep well in a cool place, “winter apples” were an important food for early settlers. -	Apple trees belong to the rose family. Other deciduous fruit-bearing trees in the rose family are pears, apricots, plums, cherries, and peaches. -	Apple trees are “self-incompatible” — each tree must be cross-pollinated with another in order to develop fruit. -	The crabapple, the only apple tree native to North America, is an important cross-pollinator for trees that will produce table apples. -	More than 2500 apple varieties are grown in United States, out of 7500 varieties worldwide. -	Apples ripen from the outside branches in toward the trunk. A ripe apple can be many colors — green, yellow, and pink, as well as red. A ripe apple should be firm to the touch, and its flesh should be crisp when you bite into it. -	“Johnny Appleseed” — John Chapman — was an actual person, raised on a small farm in Massachusetts. Beginning at age 18, early in the nineteenth century, he traveled to the American frontier, creating apple nurseries and encouraging healthy, simple living. He entered into American folklore partly because of his kind and generous treatment of all living things. 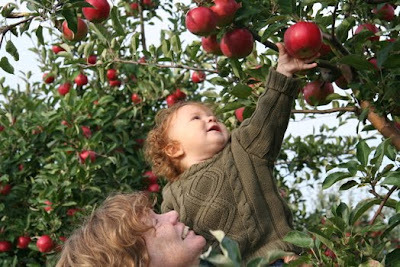 One way to enjoy apple season is to pick your own at a local orchard. Many offer hay rides, apple bobbing, and other family fun. You can find apple-picking options on this online list — alphabetical, of course. … about Johnny Appleseed in the PBS series based on Michael Pollan’s The Botany of Desire.